While Shan Shan and Feng Teng were able to jump over their first real relationship hurdle, things continue to be a big ol’ mess in Feng Teng’s world. He may have his girlfriend back, but it looks like his best bro is on his way out of not only Windgroup but also Shanghai. Who’s going to play bball with Feng Teng if Zheng Qi is gone? Li Shu? No thanks. Shan Shan and Feng Teng finally meet after a “cold war” that felt like it went on for forever. Shan Shan tells Feng Teng that after thinking about how to eliminate some of the class difference between them, she’s made up her mind to pass the CPA test and get her license. Shan Shan tells him that her career is the only thing that is within her power to change to better match him. Even if she can’t become the most suitable person for him, she’s still going to work hard to become the best Shan Shan for him. Of course, Feng Teng’s heart melts hearing her say that. Hooray, it’s the end of the Shan-Teng cold war! When Feng Teng drops Shan Shan off at her place, she tells him that she’s made one additional decision…but she won’t tell him until tomorrow. After some loving gazes and classic Shan-Teng cuteness, Shan Shan skips off to her apartment. Feng Teng is left wondering what kind of decision could Shan Shan have made. Way to leave him hanging. During lunchtime the next day, Shan Shan’s coworkers ask her to eat with them, but she tells them that she has other plans. Turns out that her other plans and the other big decision that she’s made is that she’s going to take the initiative to go have lunch with Feng Teng in his office! She even tells his secretaries that they don’t need to let him know that she’s there, and she waltzes right into his office. Girlfriend privileges, duh. Feng Teng doesn’t even notice that she’s in the room, and only looks up when she knocks on his desk to ask if she can eat here. Feng Teng tells her that he knew her decision would be something like this. He literally says, “Welcome,” to her and motions to their usual lunch spot in his office. Cuteness! Windgroup is still trying to handle the lawsuit that they were slapped with about Zheng Qi and his department copying another company’s idea for their app. During a meeting with Zheng Qi and Feng Teng, Yan Qing asks Zheng Qi if he went with his parents to Seattle two years ago. Apparently, there was an app launched during that time in Seattle that is very close to the Windgroup app. Zheng Qi gets defensive and says that he didn’t pay attention to stuff that like because he was in Seattle to visit family. Feng Teng explains to Zheng Qi that his whole team is being accused right now, so it’s not the time to get angry and irrational. Zheng Qi stubbornly says that he won’t admit to any wrongdoing, and storms out of the office. Why can’t I go to Seattle? 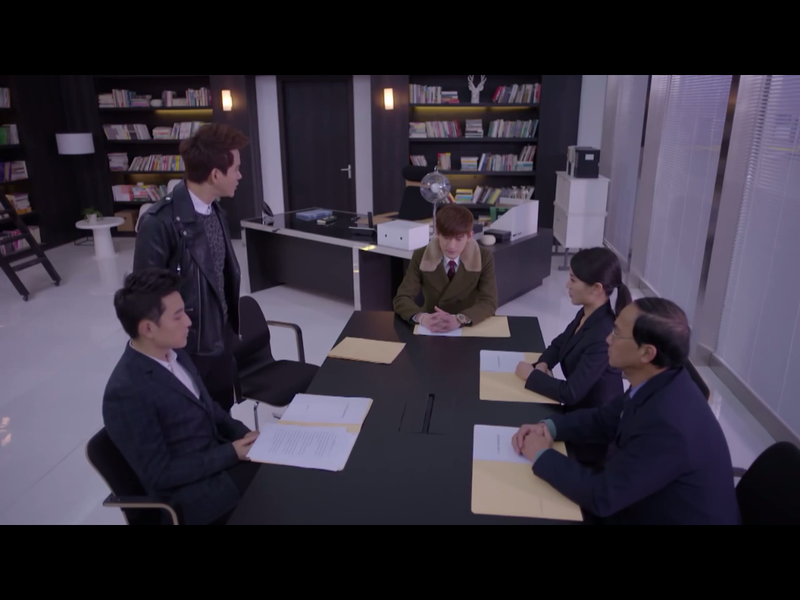 Feng Teng visits Zheng Qi at his place after work, and calmly lets him know that if Windgroup cannot come up with the evidence to prove the lawsuit otherwise, they are considering settling with that accusing company. Zheng Qi obviously gets angry hearing this, and says that Feng Teng is questioning his character and honesty by settling the lawsuit. Feng Teng explains that the Windgroup shareholders are really pressuring him to resolve the matter before their upcoming product launch. 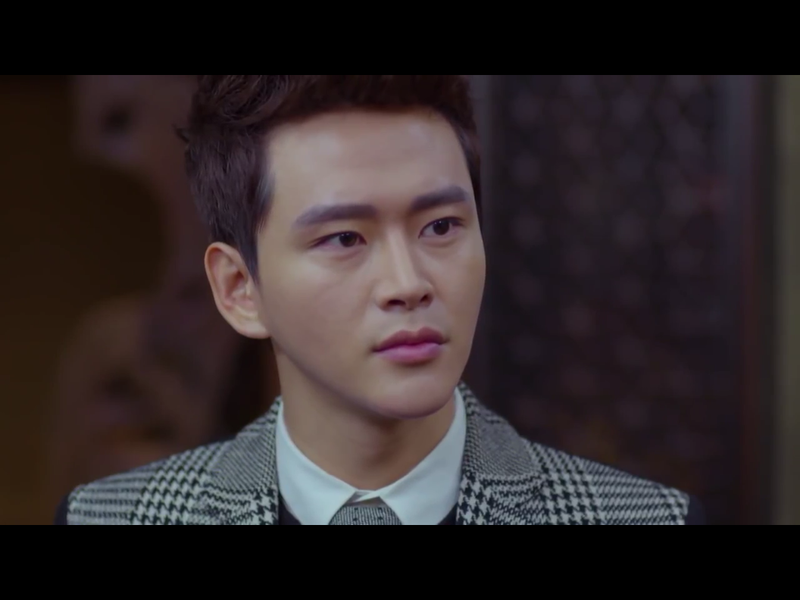 Zheng Qi refuses to back down, and Feng Teng has no choice but to urge him to think things through on his own. Feng Teng calls Shan Shan to ask her to have dinner with him, but she tells him that she has her CPA prep course to go to tonight. He insists on at least driving her to the class even if they can’t have dinner together. Aww. She gives him her class schedule so that he won’t forget next time. He asks why there are so many classes, and more importantly, when is she going to eat with him?! How did Feng Teng eat dinner before Shan Shan? Shan Shan brings all her prep books with her to Feng Teng’s office during lunch, and is too busy studying to eat. Feng Teng tells her to put down the books to eat, but she tells him to just eat without her because she has a lot of work to do. Feng Teng is astonished that she wants him to eat alone. She even tells him to eat a lot, so that he’ll have enough energy to answer her questions later. Feng Teng pouts and says that he’s her boyfriend and not her tutor. Shan Shan tells him that she’s doing all of this for their future, so of course he has to help her! Feng Teng gets a list from his secretary of all the Windgroup employees that have passed the CPA test, and has two of them tutor Shan Shan during lunchtime. This way, she can study with them and then eat lunch with him. During lunch, Feng Teng complains that there are black beans in his food and asks her to pick them out for him. Shan Shan dismisses him because she’s studying and says that she already told him to tell his chef to not cook with black beans anymore, and that he can pick them out himself. It’s true, she did tell him that before. Feng Teng, in retaliation, purposely picks out the beans and puts them into Shan Shan’s bowl of rice. So very immature yet so cute. Big lunch for just Feng Teng. After a tutoring session, Shan Shan compliments her tutors for being so smart and successful and brags about them to Feng Teng. Did I mention that her two tutors are guys? Feng Teng is totally jealous hearing her compliment other guys, but doesn’t say anything to her. But after Shan Shan leaves, Feng Teng calls his secretary to tell the guys to not come help Shan Shan with her homework anymore. Sneaky, sneaky. The next day, Shan Shan wonders where her tutors are because they haven’t come to Feng Teng’s office all of lunchtime. Feng Teng tells her that it’s not surprising that they don’t have time to help her because they have their own work to do. He says that if she needs help with her homework, then he’s more than happy to help her. Way to play it cool, Feng Teng. When Shan Shan takes him up on his offer and asks him for help on a particular question, he thinks for awhile and then says that he’ll have to do a little more research in order to give her the most complete answer. Then, he randomly brings up his own achievements that rivals those that Shan Shan mentioned yesterday of her tutors. Shan Shan totally knows what he’s up to, and she doesn’t need to guess anymore why her tutors aren’t helping her anymore. That night, Feng Teng tells Shan Shan that there’s no studying allowed at the dinner table and makes her put away her books. He asks her how classes are going, and she admits that they’re very hard and she’s always getting low scores on the quizzes. Feng Teng tells her to stop going to the classes then and to just study at home on her own. Shan Shan quickly tells him there’s no way that she’ll understand anything if she’s studying on her own. He says that she doesn’t have to pass the CPA test this year, so there’s no need to work so hard. But Shan Shan says that she has to pass the test this year to better match him as his girlfriend. When Feng Teng tries to tell her that he doesn’t care about those things, Shan Shan says that she cares. Feng Teng is hosting some sort of fancy party at his family’s mansion, and he brings Shan Shan with him. Not sure what’s the point of this party, but there’s a couple ballroom dancing in the middle of it for the guests. Sure…that happens at all the parties I go to. Feng Teng goes around introducing Shan Shan to all of his friends, including some guy who’s married to a supermodel. Afterwards, he tells Shan Shan that the supermodel doesn’t have an impressive family background or a ton of degrees. Shan Shan says that there’s no comparison between her and the model because she’s got the looks and body to compensate for it. Feng Teng teases her and says that it’s true that Shan Shan can’t compare with the model in those departments. 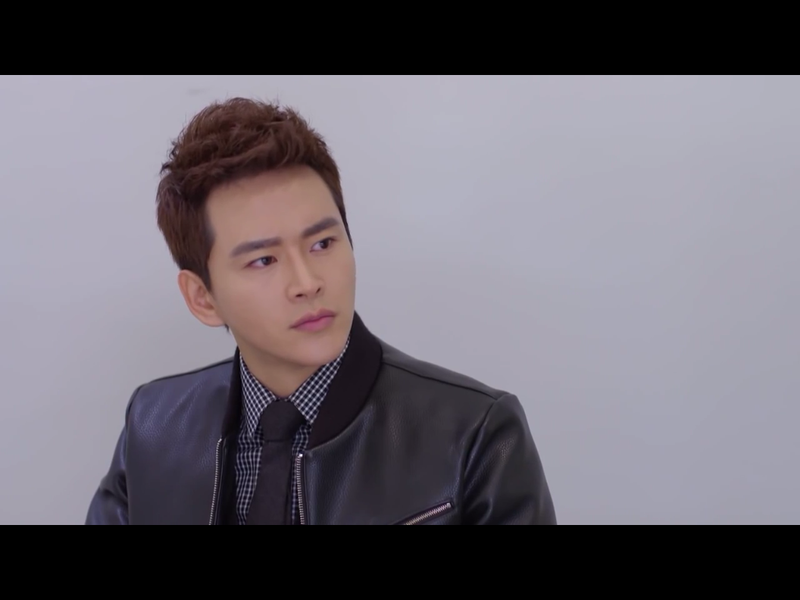 Li Shu sees Zheng Qi talking to a lawyer lady that Feng Teng introduced him to earlier, and gets jealous. So, does that mean she’s over Feng Teng? She retreats to her room to throw one of her usual pity parties, and Zheng Qi goes to find her there after seeing her leave the party. She asks him how he still has the energy to care about what she’s doing when he has his hands full with the lawsuit. Zheng Qi tells her that because of that very reason, he needs someone to talk to. Zheng Qi tells her that he just cannot accept other people saying that he would copy someone else. Li Shu reassures him that everyone at Windgroup believes him to be innocent. Zheng Qi argues back that Feng Teng agreeing to settle with the other company is a major insult to him. She says that he’s not being fair to Feng Teng then because he’s the boss and needs to consider the well-being of the entire company. By settling, Windgroup’s partnership with another company in America can be preserved. Zheng Qi says that people will see Windgroup’s partnership in America doing well, but who will remember or care that he was innocent. He doesn’t know whether or not Windgroup’s future progress will be negatively affected by this. Li Shu tells him that he should leave those things for Feng Teng to consider and not him. Zheng Qi asks if she still thinks that Feng Teng is always right and has so much confidence in him. Let’s take her silence as a “yes.” Never mind about her being over Feng Teng…she’s clearly still clinging onto him. Nobody on Zheng Qi’s side. After the party, Feng Teng asks Shan Shan how she can use studying as an excuse to not spend time with him. Shan Shan answers his question by telling him about an article she read online about a boyfriend who worked really to improve his and his girlfriend’s lives, but the gf blamed him for neglecting her instead of being more understanding. All the comments on the article said that the gf was in the wrong. Shan Shan says Feng Teng should look to this article as an example and should be more understanding of her. Feng Teng asks her how she has so much spare time to be reading random articles online but not spend time with him. Oops. Shan Shan uses her go-to reason and says that she’s doing all of this for their future. Unable to resist the Shan Shan charm, Feng Teng says that if that’s the case, she needs to keep working hard because she’s going to have to support him in the future. No prob, says Shan Shan. The latest news on the lawsuit drama is that the company that’s suing Windgroup is demanding a whopping $3 mil (USD!) for the settlement. And if they don’t agree to discuss the settlement terms with them, then they’re going to report them to the Business Bureau to prevent them from releasing their mobile phone. Feng Teng wants to meet with the company to hash things out, but Zheng Qi is having none of it. He tells Feng Teng that he understands his decision, but he’s not going to stand idly by. Since there’s no way he can stay at Windgroup under these circumstances, Zheng Qi quits his job right then and there. Shan Shan saw Zheng Qi storm out of Feng Teng’s office, so she later asks him if he and Zheng Qi fought. Feng Teng tells her that Windgroup is planning to settle the lawsuit. Shan Shan keeps asking him questions about it and Zheng Qi, causing Feng Teng to snap at her that he’s not going to discuss business matters with her. Zheng Qi is out on the balcony sulking and punching the bench. Shan Shan finds him out there and tries to comfort him. But first, she bandages Zheng Qi’s hands because he punched the bench so hard that he’s bleeding. She tells him that she knows he and Feng Teng are good friends and that even if Feng Teng didn’t say it aloud, he doesn’t want Zheng Qi to leave. Zheng Qi replies that if Feng Teng really didn’t want him to leave, he wouldn’t have made the decision to settle. All convos take place on the balcony. He’s really made up his mind to leave Windgroup, and says that he knew this day would eventually come. Shan Shan asks him where he’s planning to go now, and Zheng Qi says probably back to America. Of course, Feng Teng sees the two of them talking from the other side of the 2-way mirror in his office. Is there anything that happens on the balcony that Feng Teng doesn’t see? Shan Shan goes to Li Shu after work to tell her what happened with Zheng Qi at work, and asks what they should do now. Because Li Shu has no heart, she doesn’t act too concerned about it and says that maybe Zheng Qi has his own plans. But when Shan Shan mentions that Zheng Qi might be going back to America, Li Shu suddenly looks worried. She thinks back to how Zheng Qi said that he will wait for her to make up her mind about whether or not she likes him. Wow, selfish much?! Only thinking about how things will affect her if he leaves. Shan Shan takes Li Shu to Zheng Qi’s place to get her to talk him out of leaving because she thinks that he’ll listen to her. Li Shu is reluctant to go upstairs to talk to him though because things are still awkward between them. Ughhh. Not everything’s about you, Li Shu. Shan Shan tells her to consider it as giving herself another chance, and also another chance for Zheng Qi. Li Shu agrees to go talk to him but tells Shan Shan to not get too optimistic about her persuasion skills. Run, Zheng Qi! One of the girls from Shan Shan’s prep course saw Feng Teng drop Shan Shan off in his fancy sports car, and she was totally eyeing it all sneakily. Then, she tries to befriend Shan Shan during the class and asks her if her boyfriend is really rich. Shan Shan lies and says that her bf sells used cars, and that was a used sports car. Shady boyfriend-stealer alert! During one of her lunchtime tutoring sessions, Shan Shan is too busy staring at Feng Teng and not concentrating on her work. When he signals for her to turn away, she whispers, “I love you,” to him. He pretends to catch her words in his hand and puts it in his pocket. Super cheesy, but so cute when Shan-Teng does it. Zheng Qi acts like a temperamental 14-yeor-old girl in this episode. Good riddance, I’d say. So cute that cheesy scene between Shan Shan and Feng Teng. @felly, Sure; just send me an email at anna@dramaforreal.com and I’ll try to figure out the scene for you! I have already sent it to you. Please check it. Thank you.